The objective of this study was to assess the current state of clinical laboratory quality in clinical laboratories via the LQC Self-Assessment. An anonymous online survey captured demographics and self-assessment results. LinkedIn was used to identify potential respondents and the survey took advantage of convenience sampling. Data were extracted into a spreadsheet and analyzed for trends; 210 respondents participated in the study. Most respondents are employed by hospital and independent laboratories spanning a variety of titles. Respondents’ laboratories represent all CLIA specialties and all US regions with widely varying annual volumes and organizational sizes. The distribution of the self-assessment results is as follows: Oblivious - 4.41%, Analytical Quality (AQ) - 10.78%, Quality Assurance (QA) - 50.99%, Quality Management (QM) -17.16%, Total Quality Management (TQM) - 11.27%, Performance Excellence - 3.92%, Pinnacle of the Lab Quality Continuum - 1.47%. Furthermore, 59.83% of respondents reported that their laboratory employed at least one full-time quality professional (56.30% at the QA level and below, 67.64% at QM level or higher, and 90.91% at Performance Excellence level or higher). 67.65% reported that they felt their lab’s quality program was adequate (58.52% QA and below, 85.51% QM or higher, 90.91% or higher). See Figure 1 for key characteristics of each phase. 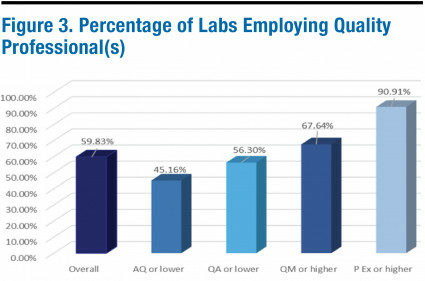 The current state of lab quality indicates that 66.17% of laboratories are at QA or lower on the LQC (study ongoing), suggesting that most labs are focusing on merely meeting minimum regulatory requirements. Positive associations exist between the employment of a quality professional and the perception that the quality program is adequate. Although there is not a statistical association between LQC assessment result and the employment of a full-time quality professional in the chi-squared (X2) tests, it is true that the percentage of labs employing quality professionals increases incrementally the higher the score on the LQC self-assessment. As a laboratory quality professional specializing in building comprehensive quality programs from the ground up and revamping existing programs, I am often asked for advice on how to improve quality systems for a specific laboratory. The formulation of recommendations for improvement takes into account the laboratory’s current level of quality, which involves an assessment of the culture of quality, the existing quality management system (QMS) framework, and the lab’s ability to effectively implement a quality program. Building on existing models1,2 and incorporating my experience in laboratory quality management assessing a plethora of labs, distinct phases of lab quality are identified and organized into a continuum. The Lab Quality Continuum is a tool designed to assist labs in determining their current level of quality, as it categorizes phases of laboratory quality along an ascending scale, delineating the characteristics of each phase (see Figure 1). Understanding where a clinical lab currently stands and the characteristics associated with its current level allows the laboratory to identify ways to move up the continuum. Information on the Lab Quality Continuum was published nationally in July 2016.4 An online assessment was developed using a research software program and also was made available to the public in July 2016.3 Free online survey software was utilized to administer the survey and collect data including the LQC self-assessment results, demographic information, and information about individual lab quality programs. The survey data presented here was collected from February 4, 2017 to March 5, 2018. Chi-squared tests were performed for the results, evaluating associations between LQC result, the employment of a full-time quality professional, and whether the respondent feels their lab’s quality program is adequate. The grouping for the chi-squared tests was QA or lower and QM or higher. A total of 210 participants completed the survey, performed the self-assessment, and received feedback for improvement. Most respondents are employed by hospital and independent laboratories spanning a wide variety of titles. Blood banks, government and public health labs, and physician office labs also participated. Respondents’ laboratories represent all CLIA specialties as well as all US regions with widely varying annual volumes and organizational sizes. There were 24 international respondents representing Canada, Chile, India, Iran, Ireland, Jordan, Nigeria, Saudi Arabia, Spain, Sudan, Tanzania, Turkey, Emirates, and The United Kingdom. The distribution of results is described in Figure 2. 59.83% of respondents reported that their laboratory employed at least one full-time quality professional (56.30% of QA phase and below respondents, 67.64% of QM phase or higher respondents, 90.91% P Ex or higher) (see Figure 3). 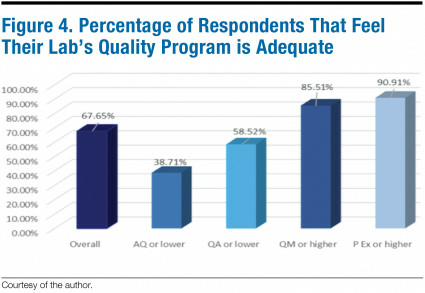 67.65% reported that they felt their lab’s quality program was adequate (58.52% QA and below, 85.51% QM or higher, 90.91% or higher) (see Figure 4). Chi-squared test statistics revealed the following: There is an association between the LQC self-assessment result and whether a laboratory professional feels his or her lab’s quality program is adequate for the lab services provided [results from chi-squared test: X2(6, N = 210) = 25.68, p < 0.001]. There is no association between the LQC self-assessment result and whether a laboratory has a least one full-time, dedicated quality professional who does not have any other duties [results from chi-squared test: X2(6, N = 210) = 9.17, p = 0.164]. There is an association between a laboratory having at least one full-time, dedicated quality professional that does not have any other duties and whether a laboratory professional feels his or her lab’s quality program is adequate for the lab services provided [results from chi-squared test: X2(1, N = 210) = 7.09, p = 0.008]. It is evident from the distribution of self-assessment results (66.18% QA or lower), that there is still much work to be done in the area of lab quality. The results of this study indicate that the majority of laboratories are currently aiming only to meet minimum regulatory requirements. The study also indicates that 32.35% of laboratorians do not feel their lab’s quality program is adequate. Positive associations exist between perception of an adequate quality program and progression along the lab quality continuum, as well as the employment of a quality professional and the feeling that the quality program is adequate. 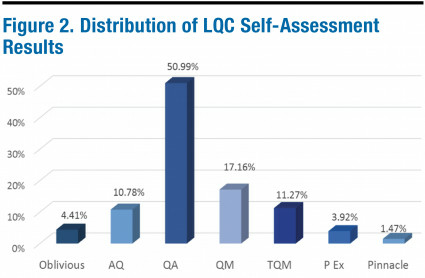 Although there is not an association between LQC self-assessment result and the employment of a full-time quality professional in the chi-squared tests, it is true that the percentage of labs employing quality professionals increases incrementally the higher the score on the LQC self-assessment (see Figure 3). As the medical laboratory industry faces the ongoing challenges of shifting reimbursement models and increasing patient awareness of lab quality and access to associated data, demonstrating quality is becoming vital. The Lab Quality Continuum and the LQC self-assessment are tools intended to help labs understand their current levels of quality and identify next steps to improve. The association between feelings of quality program adequacy and self-assessment helps verify the validity of the LQC. This study finds an association between employment of a quality professional and feelings of quality program adequacy, and suggests a positive association between employment of a full-time quality professional and a lab’s phase on the continuum. Therefore, employment of a dedicated resource to lead the lab’s quality efforts is recommended to progress along the continuum. It is the intent of this study to help laboratories gain additional investment in their quality programs and to help them gain quality FTEs. It is incorrect to assume at the QA level or lower that expending fewer resources towards quality will save the lab money. Continuous progression along the Lab Quality Continuum will reduce costs and result in the strategic advantage of differentiation in the marketplace through quality, while providing the peace of mind that comes with offering the best care for your patients. Clinical and Laboratory Standards Institute. QMS01-A4 Quality Management System: A Model for Laboratory Services; Approved Guideline – Fourth Edition. Wayne, PA: CLSI; 2011. Baldrige Performance Excellence Program. 2015. 2015–2016 Baldrige Excellence Framework (Health Care): A Systems Approach to Improving Your Organization’s Performance. Gaithersburg, MD: US. Department of Commerce, National Institute of Standards and Technology. www.nist.gov/Baldrige. The Pursuit of Excellence: Where Does Your Lab Rank on the Quality Continuum? LabLeaders.com. http://resourcecenter.lableaders.com/leadership/the-pursuit-of-excellence-where-does-your-lab-rank-on-the-quality-continuum. Accessed 10/22/2018. Dawson J. The Lab Quality Continuum. Med Lab Mag. 2016;5(6):8-13. Jennifer Dawson, MHA, DLM(ASCP)SLS, FACHE, CPHQ, LSSBB, QIHC, QLC, is head of quality and regulatory affairs for Human Longevity, Inc, in San Diego, California. She is appointed to the CLSI Quality Management Systems Expert Panel, the Cardinal Health Laboratory Advisory Board, and the ASCLS Patient Safety Committee.